Deciding to replace your printer can be mind boggling as there are so many Epson printers on the market at any one time. If you have already decided to opt for an Epson, perhaps because you have found them agreeable in the past, then be sure to do some research first. The Epson printers are primarily aimed at the home market with the vastly popular small-in-one range, thats a printer, scanner and copier to you and me! TOP TIP: The running costs of the printer should be high on the check list, for example is the EPSON XP-750 ink available as a compatible? Replacing the ink in any printer can be the most expensive part of running the printer during its lifetime so special attention should be paid to the cost of replacement ink. If in doubt, check with your online supplier if the cartridges will work OK in the printer and play any fears or concerns you may have before making the purchase. Good quality Epson 24XL ink cartridges are recommended as the most economical way to run your Epson printer. The EPSON XP-750 is an all-in-one printer that fulfills almost all the requirements of home users as well as professional photographers. The Epson XP-750 offers you high quality outputs for all functions including printing, copying, and scanning. The printer can produce a maximum resolution of 5,760 x 1,440 dpi at good printing speed. Epson XP 750 ink printer features wireless, USB, and ethernet connectivity. The device also has a PictBridge port for digital camera and / or mobile devices. You can also directly print with Epson XP 750 from iPad or iPhone using AirPrint app. Even after having many features like separate paper tray, photo tray, CD-printing tray and input tray at back, this compact printer is neatly assembled. The device also has a touchscreen panel with 8.8cm display. Which allows you to select the images directly from USB or memory card. Epson XP 750 ink is supported by both compatible and original inks. The Epson XP 750 is a perfect all in one printer for professional photographers and for the home users who are looking for high quality printing solution. Other features are also very attractive and would win buyers’ hearts. However, printer does have a few drawbacks like its processing noise and delay of output paper tray to come out (once the printer gets on). Epson XP 750 ink multipacks are also available with four colour HD inks. How to resolve print quality issues of your Epson XP-750 printer? The Epson XP-750 printer is ideal for image and photo prints. The printer uses Epson XP-750 ink cartridges that give a great quality printouts. But often printing problems arise. Faded prints, banded prints or missing prints are some of the issues faced while printing. These issues can be solved at home without much efforts. Check the message on the printer screen. It will specify which cartridges need replacement and along with their locations. Since this printer uses 6 ink cartridges, make a note of which ones need to be replaced. Click on OK and Replace Now to begin the process of replacement. Lift the scanner unit and open the cover of the ink cartridge set. This will reveal the cartridges inside. Gently pull out the cartridges that require to be changed. Shake the Epson XP-750 ink cartridges before opening the package. This ensures better printing quality using these inks. Once the package has been opened, do not shake as it may cause the cartridges to leak. There is a green chip on the top of the ink cartridge that is not supposed to be touched. Each ink cartridge will have a protective yellow tape at the the bottom. Remove this tape before you put the cartridges into the printer. Place the new ink cartridges according to the colour indicated on the cartridge slot. Push the cartridges until a click is heard. This means that the cartridge is locked into the slot correctly. Close the cover and the scanner lid. At this point you will hear the printer head move to its home position. Ink charging will take place for about 2 minutes. The screen will reflect a message showing that the ink cartridge replacement has been successful. There is a button for test print on the printer. Press that to take a test print after replacement to check if the printer is working properly. Q. What should I do if the EPSON XP-750 ink cartridges start draining out? A. When the cartridges drain out or get empty, you need to replace them immediately with the new ones. You should avoid refilling the cartridges. Instead, you can purchase compatible ink cartridges from our site which are very affordable. Q. I ordered the wrong cartridges for my EPSON XP-750. I would like to cancel my order. What is your cancellation policy? A. If you order from our website, you can return the item unopened within 7 days following the receipt of the product purchased. If the order has not been dispatched yet we will just cancel order and refund payment in accordance with our refund policy. If the order has already been dispatched, you can refuse to sign for on delivery (if the product needs to be signed for) and we will refund payment in accordance with our refund policy. Alternatively, if the order does not need to be signed for, you can follow the procedure under 'Non-faulty items' given in our terms and conditions. Check this link:- https://printerinkcartridges.ie/terms-and-conditions. Q. What is the maximum number of copies can the EPSON XP-750 printer make at a time? A. The EPSON XP-750 printer can print a maximum of 99 pages at a time. Q. What types of memory cards are compatible with the EPSON XP-750 printer? A. This printer supports memory cards such as SDXC, Memory Stick Pro-HD Duo, MagicGate, Compact Flash, MMCplus and MicroDrive. Q. Do you provide any multipacks of EPSON XP-750 ink cartridges? A. Yes, we have multipacks of EPSON XP-750 ink cartridges available on our website. Q. Do you have any special offers on the purchase of the EPSON XP-750 ink cartridges? A. Yes, if you are a first time user of our website, you can apply the coupon code D10 at checkout to get a 10% discount on our already affordable price for EPSON XP-750 ink cartridges. Q. Does EPSON XP-750 printer has PictBridge support? A. Yes, the EPSON XP-750 printer has a PictBridge port available for digital camera and mobile devices. Q. The Cartridges for my EPSON XP-750 printer are low on ink and I want to print an important document urgently. Can you please deliver the EPSON XP-750 Ink Cartridges by Sunday? A. We are extremely sorry, but if you expect delivery by Sunday it won’t be possible as our courier partner Fastway Couriers deliver the product only between Monday and Friday from 9 am to 5 pm. If you place the order on a weekend the product will deliver by Monday morning. For more details, you can contact our customer support team or visit https://printerinkcartridges.ie/terms-and-conditions for more info. Q. Do you provide any guarantee on the products purchased from your site? A. We aim at providing 100% satisfaction to our customers. In the event that a compatible or remanufactured product is deemed to be faulty, we will either replace or refund the item from 12 months following the date of purchase. All purchases made are subject to General Terms & Conditions. Q. I just finished using the original brand cartridges that came along with my printer. Now looking forward to refilling them as that cost me much less than purchasing the brand new ones. Do you provide any refill services for the cartridges of EPSON XP-750 printer? A. No, we do not provide any refill services for the EPSON XP-750 ink cartridges, neither will recommend you to do that. As refilling of the cartridges must be done accurately otherwise it may leave stains at your place or affect the performance of the printer. If you are looking for any budget-friendly cartridges, compatible cartridges is a good and better option to go for. Q. What is the shelf life of EPSON XP-750 ink cartridges? A. Estimating that the cartridges are placed in proper environmental conditions that are feasible for them, you can keep the cartridges for as long as 6 months or more. Q. 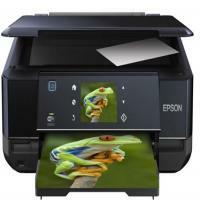 Is the Epson XP-750 printer compatible with windows 7? A. Yes, the printer works well with Windows 7. And it is a good printer with a good value for money. Q. Does the Epson XP-750 printer has the ability to print 'user defined' or is there a restriction to the usual A4, A5 etc ? A. Yes, there is an option for user defined sizes. The range of paper width is 8.9cm to 21.59cm (in 0.01cm steps), paper length is 12.7cm to 111.76cm (in 0.01cm steps). Q. Do the good quality and reasonably priced compatible Epson XP-750 ink cartridges on sale are available here? A. Yes, currently we have in stock high quality and very affordable compatible Epson XP-750 ink cartridges. If you look under "Premium Quality Ink" cartridges you will notice that these inks cost less than the original Epson inks. A money back guarantee is also offered on our premium brand compatible ink cartridges. This provides you with a 100% customer satisfaction as you can return them for a refund or replacement. Q. Does this printer has an automatic duplex, or do you have to put the paper back in yourself? A. Yes, the Epson XP-750 printer has an automatic duplex feature for printing on the both sides of paper automatically. This will also be cost-effective option. Q. Have the chips been reset on compatible Epson XP-750 cartridges to show the cartridges are full? Would the printer not print if non-original cartridges are inserted? A. All of the chips on our compatible Epson XP-750 ink cartridges have been reset but some of the times there can be an issue with any compatible ink cartridge that the ink levels aren't always reported correctly. But this is not a big problem and you can be able to install our compatible ink cartridges as normal and use up the full amount of ink within the cartridges. We have a full satisfaction guarantee on all our products. If you are ever unsatisfied with the quality of our compatible ink cartridges, then you can send them back to get a full refund. Q. Is the EPSON XP-750 ink available as compatible or non-original? A. The ink for this printer is available as both original and compatible for this printer. There are considerable savings to the made by using the compatible 18XL inks and all our cartridges, of course come with a money-back guarantee. Q.How long will the Epson XP 750 ink last in my printer if it is the generic compatible ink and not the original? A. You will receive the same amount of pages from the compatible ink cartridges as you would from the original brand ink. Q.How is the page yield calculated for the Epson 24XL ink cartridges? A. The page yield is calculated at a 5% coverage of an A4 page, this can be translated as an A4 page full of text with double-line spacing. Obviously, if there are photos or graphics the estimated page yield will change dramatically. Q. Quick question - if I order what payments options do I have? cheers. Q. I have heard that this printer XP 750 is good for printing photos is this true? Q. I am thinking of buying XP 750 ink. I have read that the yield for the ink for the XP 750 is good, however as I will be printing pre-dominantly photos, will this page yield change? A. Yes the page yield for these inks are based on a document containing text rather than full pages of coloured photo printing. This will decrease the amount of pages per cartridge however, this is to be expected with colour printing. This is the same with all brands and cartridges. Q. Is it possible to purchase the XP-750 printer from you? A. From time to time we may stock some refurbished printers, please contact our customer service department to find out if there is any availability. Q. How many cartridges does EPSON XP-750 use? What is the estimate quantity of ink in the cartridge? A.EPSON XP-750 uses 6 ink cartridges of the colours Light Magenta, Magenta, Yellow, Light Cyan, Cyan, and black. The quantity of ink depends upon whether the cartridges are the original ones or the compatible version. Our compatible XP-750 ink cartridges contain more ink than the original ones. Q. I read it somewhere that printers with 4 ink cartridges are always better than printer having more number of cartridges. I am confused about buying EPSON XP-750 printer for printing photos at home since the printer uses 6 cartridges. Should I drop the idea of buying the same? A. EPSON XP-750 is a photo printer having 6 cartridges slots. A photo printer with more cartridge slots is better since they provide more vibrant colours. Maintenance might be an issue but it yields good quality results. For printing photos, this printer is a great deal to avail. Choosing the right cartridge would enhance the quality of prints. We would recommend you to use the compatible version of EPSON XP-750 ink cartridges available on our website for vivid pictures. Q. I wanted to print photos for my portfolio using EPSON XP-750 printer and wasn’t sure about the type of paper I should use. On how many types of paper will the ink of EPSON XP-750 ink cartridges retain? A. The EPSON XP-750 ink cartridges yield ink which has high life on all types of paper which the printer supports. Your printer is a photo printer dedicated to printing photos only. It supports matte, glossy, photo and regular paper. The ink of the cartridge yields long-lasting photos on all printing surfaces. Q. I am a photography student and work on freelance basis. I need to print photos everyday in good amount. The ink of my EPSON XP-750 printer tends to exhaust really fast. Can you suggest me any solution for this issue? Q. Is EPSON XP-750 only compatible with windows operating system or can I use it with other OS too? A.EPSON XP-750 is compatible with Mac OS 10.5.8 or later, Windows 7, Windows 7 x64, Windows 8, Windows Vista, Windows Vista x64, Windows XP and Windows XP x64. While shifting to other operating system make sure to install its respective drivers. Q. How many pages can I practically expect to print using compatible EPSON XP-750 ink cartridge? A.Our Epson remanufactured ink cartridges are manufactured to ISO standard and therefore we expect the remanufactured cartridges to print equal or more than the original brand Epson ink cartridges. On moderate usage, you can expect to print 500 pages from the black cartridge and 740 pages each from Cyan, Magenta, Yellow, Light Cyan and Light Magenta. Q.What is the printing resolution of EPSON XP-750? Can I print high definition photos from this printer? A.EPSON XP-750 has a Printing Resolution of 5,760 x 1,440 DPI which can print extremely high quality and fine photos. You can use this printer for printing professional as well as daily use photos.